Its been tough to be a Canucks fan. The Canucks are the only Canadian team to never win a Stanley Cup (lost to the New York Islanders in 1982 and lost to the New York Rangers in 1996). This year has been particularly tough. The new GM, the new coach and many new players made the start of the season a bit uncertain. Nobody was sure how the team would come together or even if they could form a competitive team. The scoreboard showed mixed results through October and it only got worse into November. By Christmas everyone was hoping for an actual miracle to turn things around. Christmas came and went. Suddenly, without any warning, the Canucks look like a winning team at the same time as many divisional rivals are starting to struggle. The Boxing Day win in Calgary at first looked like a fluke but fans were ready to believe. The Flames came to Vancouver the next night for a rematch. It promised to be a very exciting game; even the scalpers didn’t have tickets to sell. We were fortunate enough to have tickets and see first-hand an overtime win by the Canucks in a game that was maybe the very best game of the season. Last night’s win against Edmonton really got the blood pumping. Sure Edmonton has been struggling lately but the Canucks looked really strong despite a rash of poor penalties in the second half of the last period. Could they make a serious run this year? Hope so! By the way, while confirming my suspicion about the Canucks’ Stanley Cup woes at Wikipedia I found some really interesting trivia about the Cup and its misadventures. I suggest having a read yourself to check it out. Comments Off on Back on the bandwagon! Two more outstanding movies to report on. We finally saw Casino Royale today, and caught The Good German a little more than a week ago. Both film are really excellent although in very different ways. Cate Blanchett and George Clooney bring outstanding performances to what may appear to be a rather mundane film. Steven Soderberg has truly captured the essence of a 1940’s film noir set during the Potsdam Conference at the close of WWII in Europe. Shot entirely in black and white using techniques and sometimes equipment from that era, the film stands out against the action-oriented films that dominate today’s theaters. George Clooney plays his role with his typical excellence however the real star is Cate Blanchett. She brings an extraordinary performance that reminds me of Ingrid Bergmen or Marlene Dietrich. The plot is not very complex and the pacing is a bit slow by comparison to Casino Royale. On the other hand, compare this film to something like The Maltese Falcon. Both films have intrigue, good guys, bad guys, and a women in desperate need of assistance. The Good German is an excellent film worthy of critical attention. I doubt this film will appeal to a lot of people but if you should see it if you have the opportunity. The photography, lighting and acting is really something special. For comparison, we saw Daniel Craig in the latest James Bond franchise film. This is the best Bond film in many years. Its packed with gritty action, a bit of cheesy dialog and a femme fatale or two. This “Bond Villain” is a classic megalomaniac but without the doomsday weapon. He is very smart however and has a great plan for personal gain to the detriment of the general populace. Although trivial, the backdrop of a terrorist organization updates the plot from the 1960s nicely. I was reminded of Goldfinger quite often while watching this film (my two favorite Bond films are Goldfinger and Thunderball). The villain is powerful and wealthy but not so powerful as to be unbelievable. The villain’s plan for personal gain is not too fantastic – its possible it could actually work. The locations are beautiful; the automobiles and gadgets are even better. The obligatory torture scene is a bit more disturbing than any other I can recall but the outcome is far superior. There is no magic involved and no special gadget that saves the day. The cheese factor is quite low for a Bond film actually, and very much appreciated. Some have said that Daniel Craig is as good as Sean Connery. I’d have to agree, and this is certainly the best Bond film in a very long time. Gosh I hope they make another one as good as this one. Microsoft suggests you should stop using their product due to security concerns. Really. Read their Security Advisory here. Do not open or save Word files that you receive from un-trusted sources or that you receive unexpectedly from trusted sources. This vulnerability could be exploited when a user opens a specially crafted Word file. It’s already an accepted fact that end-users do not (and probably cannot) differentiate malicious email attachments from safe email attachments. But never mind, Microsoft is sure that you will be able to figure it out. Right. Fortunately it’s unlikely this potential exploit will be widely abused before anti-virus vendors (like the one I work for) can respond. In case you think you’ve been a victim of this potential attack, Microsoft reminds you there is no charge for support incidents involving security updates. Hopefully lots of people will call them. 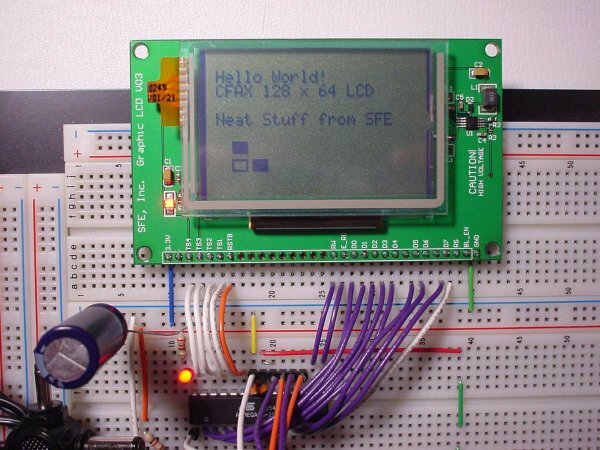 I’ve been playing with the CFAX 128 x 64 pixel graphical LCD from Spark Fun. This is a really nifty graphical display that includes a four-wire resistive touch screen and white backlight. The picture here (click it to see the larger version) has the backlight turned off and you can see it’s still pretty visible. I decided to write some simple code to draw text and rectangles. The picture shows that stuff pretty well. I also got the touch screen logic working but that isn’t really demonstrated in the picture. I’ve hooked it up to an AVR Mega 88 on a prototyping board, which gives just barely enough output pins to drive it. I will probably switch to a 40-pin Mega 16 to complete my experiments, as I want to use it with my on-going CAN project; it will require a few more i/o pins that what the 28-pin Mega 88 has available. The idea is to make the LCD available to all CAN nodes in a larger, multi-processor robot suitable for the SRS Robomagellan contest or something similar. The display has its own memory buffer for the 128 x 64 pixel grid and also has about ten different icons above the top row. It’s pretty simple to interface, and fortunately Spark Fun has some useful sample code here. I also found some sample code from the original manufacturer here. I also found a nifty article in a recent Circuit Cellar that gave me some inspiration. Look for the issue that covers various video, LCD and LED display projects. My long-term goal is to assemble all of my AVR software into an open source package under the GPL. When I get around to doing it I’ll post it here. I just finished uploading some more photos of the most recent minisumo project The Thin Man. You can see the whole project here. This was one of my more ambitious projects and I’m really pleased with how it turned out. There is more work to do though. 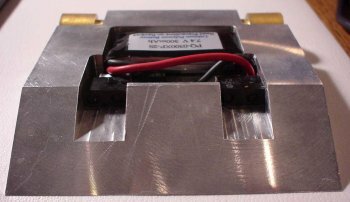 I’ve got to find a new, stronger battery that will still fit in the same form factor as the original one is just too weak for the latest GM11 motors I installed. And I will probably make a new circuit board, those wire patches just look too ugly and I want to improve the layout of the line sensors and will probably raise the forward-looking sensors slightly. And I really, really need to write some good software for it. I never did figure out what was wrong with the sensors at Robothon, but I’m sure its a software problem. Hope you find the project as interesting as I did. The next likely competition I will enter will be the Western Canadian Robot Games, typically held in May every year in Calgary. I went out there this past May (pictures here) and had a great time but next year I will have a really cool minisumo to show off!